Weight 19.9 pounds. 7.9 pounds. Not specified. 15.9 pounds. 6.6 pounds. Dimensions 40.4 x 5.9 x 5.5 inches. 3.8 x 29 x 5 inches. Not specified. Not specified. 26.2 x 3.2 x 5.5 inches. Stump Diameter/pull limit 5000 pounds. ¾ of a ton. 2500 pound capacity with a 20 foot reach on a single line. 5000 pound capacity with a 10 foot reach on a double line. 5 tons. 2000 pounds. How to Select the Best Tree Stump Puller? Tree stump pullers come in many different forms. In fact, if it pulls a stump, it can essentially be called a stump puller. However, it can be difficult to find the best stump puller for the money. This is because users have to make sure the stump-to-puller ratio is correct. Within this buying guide we aim to show you several different stump puller options for both professionals and home users. Many of these may be suitable for the stump you’re looking to pull, or they might not be. It pays to review all stump pullers very carefully in order to ascertain whether this particular stump removal method is the right one for you. When a tree is cut down, the stump left behind doesn’t conform to any particular size or shape. In fact, you won’t find two stumps that look the same. That is why stump removal with a stump puller can be a particularly difficult task. You need to take stock of all the different tree stumps you have for removal, and this can help you determine the type of tree stump puller that will suit your needs. Removing a tree stump safely takes a lot of planning. Often, people use a tree stump harness attached to a vehicle or a machine to slowly pull the stump from the earth. However, if you go too fast, the stump can fly through the air. If you go too slow, the process might take a while. When you’re removing a stump, you need to make sure there are several people helping you do it. This can be helpful if the stump removal process goes wrong. The efficiency of the stump pulling device depends on what it’s made out of and its pull limit. Some stump pullers are only suitable for small backyard tree stumps, therefore they have a breaking point. Others are more suitable for commercial or industrial settings and these generally have a much higher pull limit. Check out the products within our buying guide to see which is going to be the most efficient for your tree stump pulling operation. Features vary for each tree stump puller, depending on the make, model or manufacturer. In some cases, a winding rope and cable is connected to a revolving cylinder within a tripod setup. This can be powered by an engine or with levers. 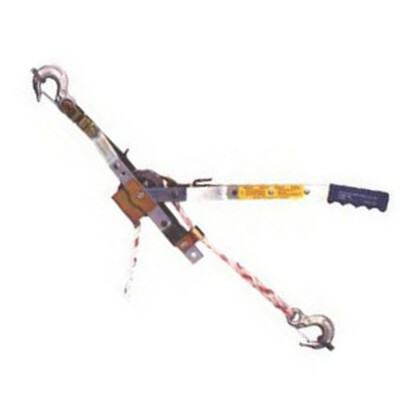 In other cases, the tree stump puller features a harness which can be attached to a vehicle such as a truck or tractor. Maintenance of tree stump pullers is generally very easy. In the case of tree stump pullers which require manual labor, harnesses should be checked for rust, imperfections, rips and tears. If the stump remover is engine-powered within a tripod setup, you should check the oil and fuel levels. Regardless of the tree stump pulling product, you should always make sure it’s free from any broken parts that could cause the operation to become unsafe. In order to get the best stump puller for the money, you should consider how much manual labor you are willing to do. Often, the price tag can be reflective of how much energy the operator has to put in. For something that’s engine powered, you can expect to spend over $1000. 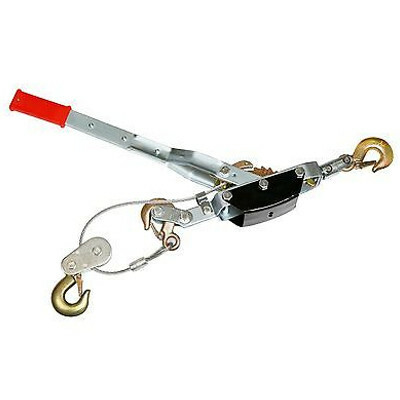 For harnesses and manual pullers, they are for sale from around $30. It’s a clean approach to stump removal. It’s a very affordable product. It can remove metal poles as well as tree stumps. It can only remove small tree stumps. It doesn’t come with the chain necessary to remove stumps. Dimensions: 40.4 x 5.9 x 5.5 inches. Stump Diameter/pull limit: 5000 pounds. QDoes the chain come with the puller? ANo, you have to purchase it separately. QWhat is the post puller made out of? A1 ½ inch thick square steel tubing. 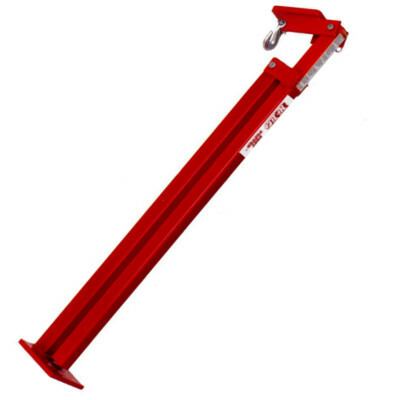 Feedback about the Hi-Lift Jack has been exceptional. It’s durable, hardy and can remove small tree stumps with ease. Although it’s not suitable for larger tree stumps, it still has a pull capacity of up to 5000 pounds. This makes it useful for not only tree stumps, but fencing as well. For the cost, it represents good buying and is easily one of the best tree stump pullers for the money. Check out what other people who purchased this product think about it. Read Hi-Lift Jack PP-300 tree stump puller reviews. It can pull up to ¾ of a ton. It has a long and flexible reach. The rope can sometimes slip under heavy loads. It can be very labor-intensive to crank the lever. Dimensions: 3.8 x 29 x 5 inches. Stump Diameter/pull limit: ¾ of a ton. QWhich rope is recommended for use? AThree strand, it’s a lot stronger. QHow much rope comes with this tree stump puller? QWhat is the limit on the rope length? AAny length of rope can be used. 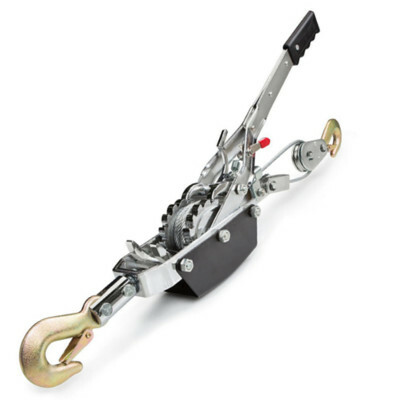 If you’re not scared of a little hard work, this stump puller will help you on your way to a stump-free backyard. It’s powerful, durable and can provide up to ¾ of a ton of pulling power to lift small and large stumps. It’s also easy to assemble and even offers the option of using a longer rope, rather than the three-strand 20 foot rope supplied. Overall, it’s top rated on the market and is one of the best tree stump pullers on the market. Check out what other people who purchased this product think about it. Read Maasdam A20t Tree stump puller reviews. It has a dual ratchet drive design for versatility depending on the stump you’re pulling. It’s made of solid steel. It requires less manual labor than other similar products on the market. It’s quite expensive in comparison to other similar products on the market. The engaging and disengaging mechanism isn’t as strong as it looks, some users note. Tuf-Tug Dual Capacity Cable Hoist/Puller. Stump Diameter/pull limit: 2500 pound capacity with a 20 foot reach on a single line. 5000 pound capacity with a 10 foot reach on a double line. QWhat is the hook-to-hook distance? QCan you lower the load slowly, notch by notch? QWhat is the cable diameter? It can sometimes be difficult to find a heavy-duty stump remover that you know will handle those larger jobs. The reason this product is top rated is because it can handle those larger jobs, and more. It has a dual capacity of 2500 pounds and 5000 pounds – perfect for those larger stump pulling operations. Check out what other people who purchased this product think about it. Read Tuf-Tug tree stump puller reviews. It has a high leverage ratio which makes it easier to operate. It has an automatic let-down safety catch for the operator’s peace of mind. The cable is too short for a range of jobs. The instructions for use aren’t very clear. Stump Diameter/pull limit: 5 tons. QHow long is the cable? QWhat can it do other than pull stumps? AIt can pull heavy machinery and equipment, free stuck vehicles, hoist objects and even tighten fences. Although functional and durable, this ATE Tools Puller has its downfalls. The cable is just too short for many pulling activities. Even though it’s for sale at a very affordable price, users must make sure the cable is long enough for the stump they are looking to pull out. Check out what other people who purchased this product think about it. Read ATE Tools tree stump puller reviews. It’s durable with a corrosion-resistant galvanized finish. It has a very strong cable. The ratchet handle is padded for added comfort. It’s best suited to smaller tree stumps unless you dig the stump up. Its pull limit is less than other similar products made with weaker components. Tekton Dual Gear Power Puller. Dimensions: 26.2 x 3.2 x 5.5 inches. Stump Diameter/pull limit: 2000 pounds. QWhat kind of cable comes with it? AAn aircraft-grade braided steel cable that’s 3/16 inches thick. QHow far does it extend? QHow easy is it to pull stumps out with? AIt’s relatively easy if the stumps are smaller than 8 inches. Any bigger and the operator will need to dig the stump and cut major roots while pulling. Not all tree stump pullers are created equal, that’s why it’s important you review each product to ensure it’s fit for purpose. 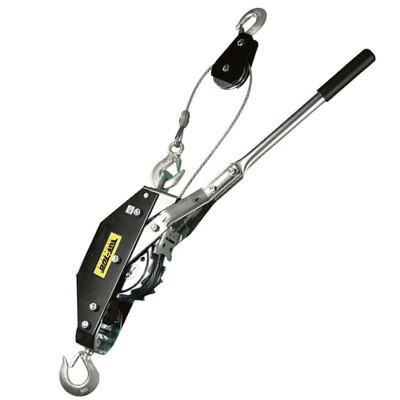 However, this puller certainly meets the mark when it comes to durability, price, versatility and ease of use. For these reasons, it’s top rated on the market and is one of the best stump pullers for the money. Check out what other people who purchased this product think about it. Read Tekton 5542 tree stump puller reviews. Where to Buy Tree Stump Pullers? When you’re looking to buy an affordable and top rated tree stump puller, there are many places to look. Firstly, you can often get the best deal when you buy online. Amazon offers so many tree stump pullers at highly competitive prices. Otherwise, you can shop around in your local area to see what hardware stores can offer.